Teaching credibility assessment to children. Subramaniam, M., St. Jean, B., & Taylor, N. G.
Workshop to be conducted at the MLA & DLA Joint Library Conference, Ocean City, MD, May 5, 2016. St. Jean, B., Taylor, N. G., Kodama, C., Subramaniam, M., & Casciotti, D.
Research talk presented at the ASIS&T 2015 Annual Meeting, St. Louis, MO, November 6-10, 2015. 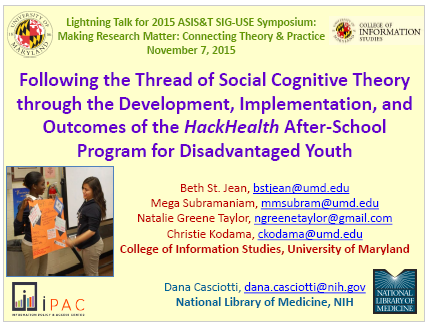 St. Jean, B., Subramaniam, M., *Taylor, N. G., *Kodama, C., & Casciotti, D.
Lightning talk delivered at the 2015 ASIS&T SIG-USE Symposium: Making Research Matter: Connecting Theory and Practice, St. Louis, MO, November 7, 2015. 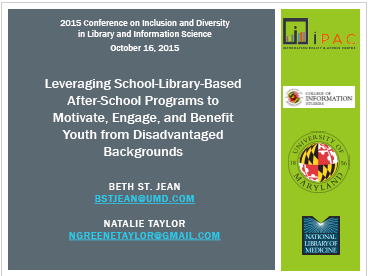 St. Jean, B., Subramaniam, M., Taylor, N. G., Kodama, C., & Casciotti, D.
Research talk to be presented at CIDLIS (Conference on Inclusion and Diversity in Library and Information Science) 2015, College Park, MD, October 16, 2015. Taylor, N.G., Kodama, C., St. Jean, B., Subramaniam, M., Follman, R., & Casciotti, D.
Preconference workshop held at the American Library Association’s 2015 Annual Conference in San Francisco, CA on June 26, 2015. As the Internet becomes more essential in meeting young people’s everyday life and academic information needs, ensuring that students have the skills needed to assess the credibility of online resources becomes more critical. These skills are particularly difficult to teach, largely due to the ambiguity of what makes a site both credible and relevant to a young and inexperienced searcher. This workshop, held on June 26, 2015 in San Francisco, CA at the American Library Association annual conference, introduced participants to methods of credibility assessment. This instruction was informed through research conducted by a team at the University of Maryland, in collaboration with school librarians in selected middle schools. This collaborative team runs weekly after-school sessions through the program, HackHealth, wherein young people learn to become effective users of health information, increase their health literacy and health-related self-efficacy, and make positive changes to their health behaviors. 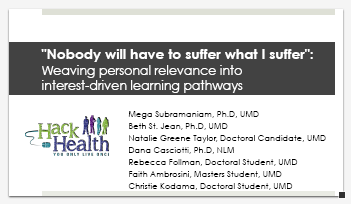 By selecting, researching, and presenting on a health topic of personal relevance, students learn valuable skills of digital research in a way that is connected to their own lives. Activities focused on developing ways to incorporate skills learned into the participants’ teaching practices. St. Jean, B., Subramaniam, M., Greene Taylor, N., Follman, R., Kodama, C., & Casciotti, D.
In this presentation, we share results from an exploratory field experiment conducted with participants in the HackHealth program. Our goal in conducting this experiment was to investigate whether/how students’ pre-existing health-related knowledge and their perceptions of this knowledge influenced the ways in which they formulated their queries, selected search results, and responded to health-related questions. Follman, R., St. Jean, B., Subramaniam, M., Taylor, N.G., Kodama, C. & Casciotti, D.
We present the HackHealth program as both a context for research in information behavior and the result of research in that context. 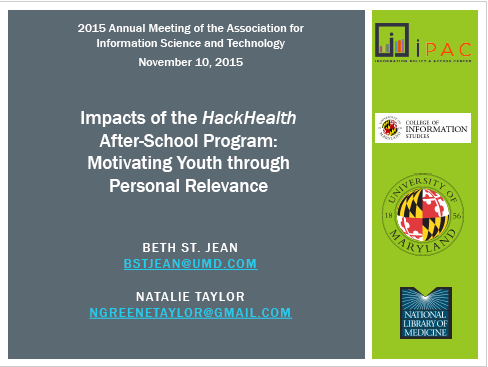 In partnership with school librarians, the HackHealth researchers developed curriculum modules for use with students participating in the afterschool program. Our research targets an understudied population and focuses on health information literacy among this population. Exploring health and information literacy: How to reach tweens. Taylor, N. G., Subramaniam, M., St. Jean, B., Kodama, C., Follman, R., Ambrosini, F., Casciotti, D., Bethea, M., Montgomery, S., & Oxley, R.
Talk presented at the Maryland Association of School Librarians 2014 Annual Conference, Linthicum Heights, MD, October 17, 2014. 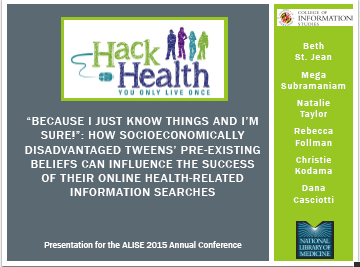 This presentation explores how to implement health and information literacy lessons for middle school students. Presenters will demonstrate activities from HackHealth, a program in which students learn about health topics of their choosing and develop digital literacy skills, such as identifying keywords, refining searches, and evaluating the credibility of websites. Subramaniam, M., St. Jean, B., Taylor, N.G., Casciotti, D., Follman, R., Ambrosini, F. & Kodama, C.
2014 Digital Media and Learning Conference, Boston, Massachusetts. March 6-8, 2014. We present the learning pathways of tweens who engaged in personally relevant health explorations. Utilizing qualitative methods, we highlight how such explorations assisted tweens in seeing themselves as health ambassadors for their family and communities, and how they map the relationship of personal-relevance practices to sustained interest in STEM fields. Subramaniam, M., St. Jean, B., Taylor, N.G., Follman, R. & Casciotti, D.
2014 Association for Library and Information Science Education (ALISE) Conference, Philadelphia, Pennsylvania. January 21-24, 2014. We present our methodological approach to and lessons learned from an NLM-funded project in which we are working with school librarians to develop and implement after-school programs to engage disadvantaged youth in becoming health entrepreneurs. We aim to increase their interest in science/health, their health literacy, and their health-related self-efficacy. 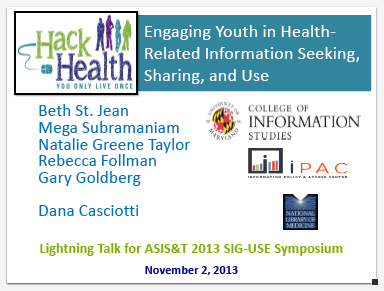 St. Jean, B., Subramaniam, M., Follman, R., Taylor, N.G., & Goldberg, G.
This Ignite talk introduces HackHealth, a program during which disadvantaged tweens work to: (a) conduct scientific inquiry to maintain health and/or prevent/manage disease; (b) act as health information intermediaries; and (c) take action based on what they learn. The program operates at the intersection of information needs, seeking, and use.